Mutantkind as a demographic group is a terrible analogue for any real world demographic group and people should probably stop doing it. I have no idea if Stan Lee or Jack Kirby had the Civil Rights Movement on their minds in 1963 when they created the X-Men — it certainly doesn’t peek through much in the text if they did — but it’s undeniable that for four decades writers have mined that vein, and it’s resonated with a ton of readers. Individuals who are feared and hated for what they are, the search for safe spaces to “be themselves”, the path to taking pride in their identity, drastic measures taken to hide or “cure” their differences, it’s completely understandable why so many people of so many stripes saw themselves in these stories. If those stories helped anyone grow as self-actualized individuals that’s fantastic and I don’t want to take that away from any human past, present, or future. This was all well and good back in the 1970s when writers were able to tackle racism, homophobia, religious persecution, etc. in coded terms, flying under the radar of the Comics Code Authority. But it’s not the 1970s anymore and Marvel can (and should) just go ahead and tackle those issues directly. If the creative staff at Marvel isn’t sure they can handle these topics using real people and cultures properly, go ahead and find some people who can. This isn’t a huge problem and I don’t really mind these stories of individuals, except for the times when fans and companies point to Nightcrawler’s fuzzy blue skin or Deathbird’s Shi’ar heritage as examples of diversity. Most people have learned not to say that (in public) so this is a much smaller problem than my real issue. 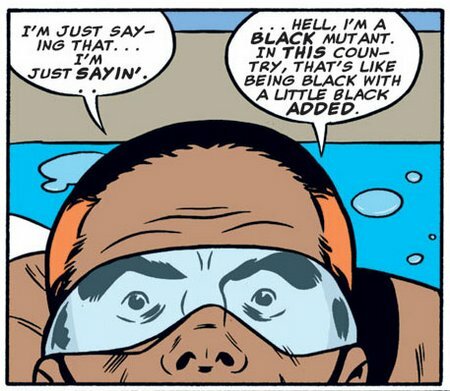 Really though, mutants are just like black people! You know, Professor X is Dr. King, Magneto is Malcolm X, Apocalypse is Yakub, Cable is um… Michael Eric Dyson? First off, mutants are basically a few pocket groups of people who are almost entirely dedicated to fighting crime, fighting people who hate them, or fighting each other. You can barely (barely) try to take major sociopolitcal opinion leaders on Civil Rights and map them to mutant figures, but mutants exist in such a narrow band of society it’s absurd to even try. 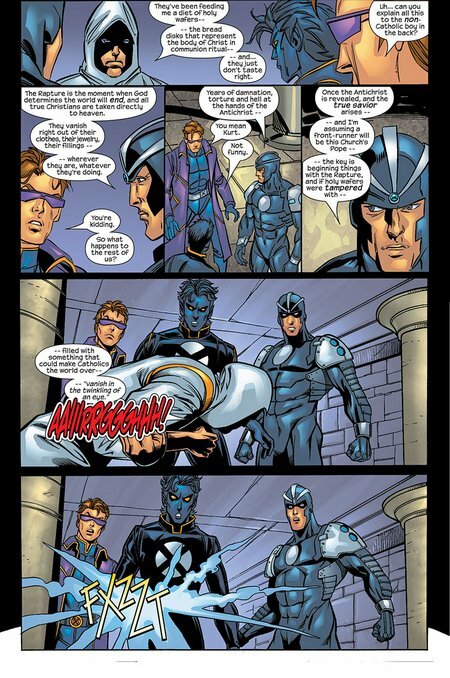 Reduced to soundbytes, Xavier/King are all about peaceful coexistence and integration, and Magneto/Malcolm are about protecting their people “by any means necessary”, but neither real-life leader existed in the sort of mutant culture vacuum that Magneto and Xavier do. There’s no “mutant” Barack Obama because no mutant is ever going to run for state Senate, much less President in a mainline X-Book. There’s no “mutant” Frederick Douglass or WIlma Rudolph or James Baldwin or Kanye West or Jackie Robinson or Bill Cosby or James Brown or Clarence Thomas or Beyonce or Neil DeGrasse Tyson or Laverne Cox or Condoleezza Rice, because superhero comics can’t be bothered to tell stories involving those types of figures. Likewise, you can map out a couple of characters to (say) George Wallace or Lyndon B. Johnson if you really squint, but there isn’t and will never be a “mutant” Thomas Jefferson, or Amos & Andy, or Branch Rickey, or Vanilla Ice, or Eminem, or Rachel Dolezal either. Superhero comics generally concern themselves with such a narrow, hyperbolic, violent plane of existence that mutants will never really have anything even approaching the depth and complexity that actual cultural intersections have. We’re not even talking two-dimensional. ALSO: you know how all of this complexity exists for real life black people? Because one or more of their parents were black. Their family is black, and there are parts of the world with large traditionally black populations, but also areas where there traditionally were not black people, and black people have existed throughout history, and black people interact with each other and other people their entire lives. This history (personal and cultural) informs everything for better and worse. Mutants exist because a random gene (or writer) decides one day that at puberty you’re going to burst into flame or grow horns or whatever. 99% of the time, your parents weren’t mutants, and even if they are they can set people’s blood on fire while you just turn into a giant snake. There’s no historic mutant district in big cities, no mutant homeland, no genealogy project to find out that Jimmy Fallon is in fact 1/16th mutant and that Michael Chabon’s ancestors owned mutants. The harder you work at developing it, the less sense it makes. I guess there’s at least one Historically Mutant College out there, though. Okay okay, but what about mutants serving as the LGBT community? Straight parents have gay kids, they’ve existed forever but have only become a public demographic in the recent past but they’re still actively persecuted in many parts of the world. Mutants are gay! Mister Sinister is Oscar Wilde in this scenario, and Professor X is Morrissey? I admit, this is a better fit, especially in terms of localized social groups and especially in terms of Sinister being Oscar Wilde. You get the whole “coming out” process, self-loathing closeted politicians, people trying to ‘pass’, praying the mutant away, taking medication to suppress their mutant powers, girls pretending to be mutants at frat parties to impress humans… at least some of these things have happened in comics! Honestly, if you’re doing a pedagogical X-Men story about how bigotry is bad, going the LGBT route is probably the way to do it in the 21st century, and it’s been done to fine effect. I’m extra fine with people using this on a person-to-person level as a metaphor in stories. The flatness of the Mutant Experience in comics is a little easier to swallow in this case because while there’s been a sub rosa culture for millennia, the idea that big public organizations and structures dedicated to LGBT/mutant culture only started in the past several decades is an easier pill to swallow than “There were only a handful of [Jewish/Chinese/whatever] people, living in secret up until 1985, but now they’re everywhere!” That’s not an accurate depiction of the gay experience either, but at least you can close your eyes and pretend it is for a second. When you expand it out to the grander narrative of Marvel Comics of the past fifteen years, it gets really silly. As everybody knows, Mutantkind was decimated in 2005 when Wanda Maximoff used her poorly defined mutant powers to take away all mutant powers except for a few of the most marketable ones. For the next eight or so years, the mega-arc of all of the X-Books was about people desperately trying to “preserve/re-ignite the Mutant race”, culminating in 2012’s Avengers vs. X-Men, where the X-Men’s militant leader Cyclops thought that rolling the dice on “the destruction of the planet Earth” versus “a cosmic being might bypass planetary annihilation and instead reignite the mutant gene” is a gamble worth taking, and the Avengers thought it might not be? Chaos ensued. Eventually a combination of faith-based mutant action, faux-Eastern mysticism, chaos magic, and pep talks about responsibility from Spider-Man really did end up re-igniting the mutant gene, so there are new mutants again! This probably isn’t seen as a boon by anyone who turned into a mutant acid monster and accidentally dissolved their prom date, or anyone who gets killed the next time a freshly minted evil mutant decides to pull a double 9/11 and destroy four skyscrapers to prove they’re a threat worthy of fighting X-Force and X-Factor at once, but this is still a net societal good, right? I mean, where does Captain America get off saying that a world where no more mutants are born is a just one? A decent portion of the Marvel creative staff and readers decided that Cyclops was 100% in the right, and even if this mutant renaissance wasn’t a foregone conclusion, how can you blame people for wanting to preserve their culture? Who wouldn’t want something so central to the core of their self preserved for future generations? While I can’t disagree with that in real world terms, what exactly is the core identity for mutants? 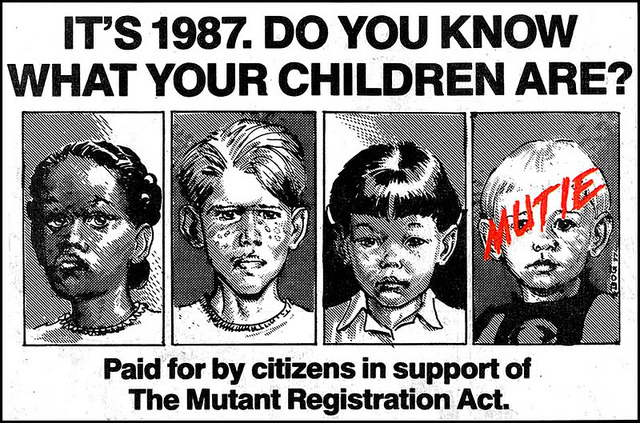 As previously stated, “being a mutant” isn’t something hereditary or cultural in any meaningful sense. 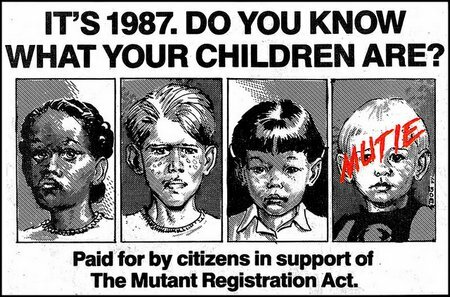 People aren’t raised mutant, and while they’re born mutants (except when they’re not), what does that really mean? This is again where LGBT identity is a much better guide than race or creed or culture, but even then: beyond affinity culture overt or covert, the biggest thing that brings LGBT people together is the basic human need for love. If you were a gay woman who found out that the population of gay women was reduced drastically, and that no more women will ever be gay, then your chances of romantic love have just been damaged horrifically. Not so for mutants! Mutants can and have formed romantic bonds, marriages, even had children with just about anyone. Not only have mutants loved mutants, they’ve loved baseline humans, differently-powered humans, Inhumans, Eternals, Externals, demigods, alien races, hybrid alien/humans, clones of past lovers, synthetic lifeforms, abstract cosmic entities, time travelers, ghosts, possibly themselves from an alternate dimension, I forget. If there were never more than 198 surviving mutants, those 198 would still do fine on Tinder. Part of this is that outside of the ill-defined biological/sociological concept of ‘mutants’, mutants have nothing in common. Even genetic abnormalities in the real world (say, left handed people) have shared experiences with left-handed issues like constantly being given the world’s worst left-handed scissors; Emma Frost’s experiences growing up as a rich telepath in Massachusetts compared to Maggott’s experience under Apartheid with two giant metallic sentient slugs instead of a traditional digestive system have as little common ground as my left-handed scissors struggle versus a blind person, or someone who can wiggle their ears. We’re all “different”, but who isn’t on some level, and why should we all band together and fight crime? Why would we have to go to a special school and protect humanity, because of these quirks of birth? And most of all, what sort of extreme measures can you expect any of us to take in order to ensure that future generations are left-handed or color-blind or good at moving one eyebrow just like the Rock? Comics which tackle real world issues between individuals using the lens of “mutants” instead of real world groups: Fine. Comics which tackle real world issues in society using real world groups: Better. Comics which tackle real world issues in society using the lens of “mutants” instead of real world groups: STOP. Though I remember someone suggesting in an un-Googlable way that the X-Men should be used as a metaphor for explaining gun ownership in America. I’m willing to let Marvel give this a shot, if I ever thought they would!